Four Mallet Studies is a complete method book for mallets by acclaimed vibist Gary Burton! The book opens with detailed pages of text and photos of hand positions, and then delves into various exercises in chord sequences, chord inversions, independence between hands, the development of strength of each mallet, and the theory and application of voicing. 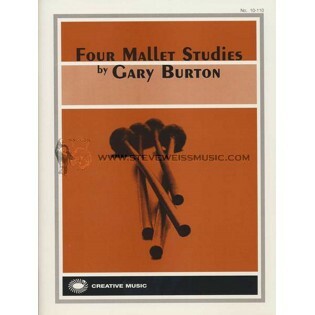 A must have for the student of four mallet playing who wishes to develop maximum control. This book is awesome. It helps you move voicing all over the instrument and frees you up to play what you hear. Its amazing. A must for any serious four mallet player.